UPDATE: See the video of me on NewsChannel 8 here. I will be on DC’s NewsChannel 8’s Federal News Tonight — and we’re going to talk about the Obama administration’s transparency and open government initiative. Of course, on January 21, 2009, President Obama, in one of his first acts, signed the open government directive. That set out a process that took longer then many people expected, but agencies from February 6 through March 19 are in the process of looking for citizen input on their open government plans. This is part of a pretty amazing change in mindset for agencies — asking for help. But there is a broader question about the open government initiative: Does it help agencies accomplish their missions better? The poster child for transparency is the Recovery.gov Web site — it is the Web site for the Recovery, Transparency and Accountability Board to demonstrate how the $787 billion stimulus bill is being spent. And in many ways, the recovery board has been bludgeoned by transparency — and we all remember the stories about the incorrect congressional districts that were on the Recovery.gov Web site. But many open government advocates suggest these kinds of incorrect data are the reason for transparency — the data was fixed because it was identified and highlighted. It was part of the idea behind transparency and open government –crowdsourcing oversight. And open government advocates suggest that those kinds of data errors are there, but it often will go un-fixed. In the case of Recovery.gov, it has been fixed because of openness and transparency. Last week on Federal News Radio 1500 AM’s Daily Debrief with Chris Dorobek and Amy Morris, we spoke to Jake Brewer, director of engagement at the Sunlight Foundation, about his piece, 9 assumptions at the heart of open government. His take was that this is important for government — and you can hear that conversation here. But if open government is to really take hold, it has to be more than theory — it has to be more then apple pie. It has to actually enable agencies to better accomplish their missions. And there is some early evidence that transparency and open government does have an impact on how people view their government.ForeSee Results, the company that does assessments of how well citizens trust government Web sites, has recently completed the first of its kind survey of how people — citizens — view transparency and open government. They call it the E-Government Transparency Index [registration required]. And Larry Freed, the president and CEO of ForeSee Results, tells Federal News Radio that there is a very real impact. If you make your Web site more transparent — if you make government more transparent — not only are you going to have the feel-good things that are so important about how citizens feel and how they trust government, but it’s actually going to lower the cost of delivering information, because more and more people will utilize the Web to get that information. Hear our conversation with Freed here. But there is a larger concept at play here — the concept of “we the people.” It is part of the concept behind government 2.0 and, without being too melodramatic, democracy — that is that all of us are smarter then each of us individually. There are now tools out there that enable people to tap into the wisdom of crowds — and that demands openness and transparency. 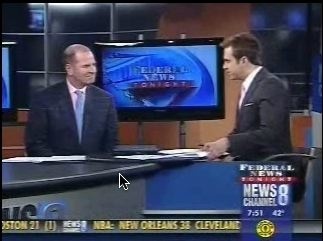 And tonight on News Channel 8’s Federal News Tonight in the 7:30p ET half-hour. Meanwhile, some resources on the Obama administration’s open government and transparency initiative.